Born in Chisholm on Minnesota’s Iron Range, John Anton Blatnik (1911–1991) was a politician, serving in the U.S. Army Air Force in World War II, as a member of Minnesota State Senate 60th District from 1940 to 1944, as U.S. Representative from Minnesota’s 8th District from 1947 to 1975, and was a Minnesota delegate to the Democratic National Convention in 1960 and a member of Democratic National Committee from Minnesota in 1963. He spent eight years in teaching in St. Louis County schools until he was elected to the Minnesota Senate at age 29 in 1940. 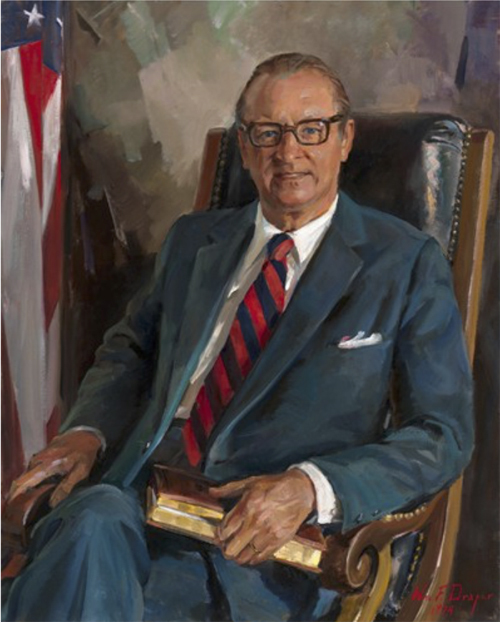 In 1946 he was elected to Congress and served 13 terms, until 1975. According to a 1991 St. Paul Pioneer Press story about his passing, “Blatnik entered Congress in 1947 at age 35 in a freshman class that included Richard Nixon and John F. Kennedy. At the time, he was the only Democrat from the Upper Midwest in a House controlled by Republicans. … By the mid-1960s, the political pendulum had swung to the Democrats, and Blatnik became a powerful force in the House.” In 1957 he chaired a House subcommittee that investigated the tobacco industry’s claim that filter cigarettes were “safer to smoke”; the study called the statement “completely phony.” While he rescued a bill to create Voyageur’s National Park, but when Reserve Mining was dumping taconite tailings into Lake Superior, he was initially reluctant to take action. Blatnik was a big supporter of the St. Lawrence Seaway, helped pass the 1972 Clean Water Act—and voted against the Civil Rights Act of 1964. When he retired after 28 years in office (1947–1975), Jim Oberstar—Blatnik’s administrative assistant—took his place in Congress. Oberstar served until January 2011. In 1971 the Duluth-Superior Bridge was renamed in his honor. When the bridge was rededicated in Blatnik’s name in 1971, Secretary of Transportation John Volpe said that Blatnik “played a key role in establishing and fostering the foundation for this magnificent [Interstate Highway] program back during the Eisenhower Administration.” The 7,975-foot bridge and its 2,800-foot approaches were built in 1961. It was originally called the “Duluth-Superior Bridge (Minnesota-Wisconsin).” Local folks often refer to it as the High Bridge.